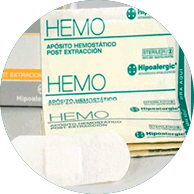 Sterile nonwoven dressing uniformly coated with an hypoallergenic pressure-sensitive adhesive. Contains a soft pad of ultra absorbent synthetic fibers that expand when it comes in contact with the blood from the puncture site and stop the bleeding. Recommended for use after blood extractions in hemodialysis and hemapheresis. Provides an excellent protection against possible infections.